What is the Warranty I Get with an ADT Monitored Security System? One of the things that can significantly add to the cost of owning a home security system is the cost to fix or replace it when it needs service. You can have an inexpensive initial cost and a low monthly monitoring rate, but be charged large amounts for service after the installation. So what does ADT’s warranty with residential monitored security systems include? ADT Security has one of the best warranties on residential security systems in the industry. 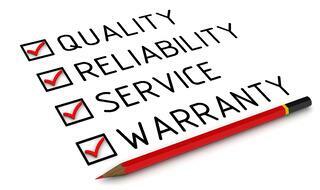 The extended ADT warranty is part of the monthly monitoring rate on all packages that include the Quality Service Plan. Make sure the monitoring service you decide on has the Quality Service Plan included. Any service that is needed it the first 90 days to fix or replace a defective part of the equipment will be at NO CHARGE. With the Quality Service Plan (QSP), also called the Extended Limited Warranty, you will receive free replacement parts and repairs for as long as your continue your ADT monitoring service with QSP. The only charge to you will be a then-applicable trip charge which is currently around $25 for most customers in Metro Areas throughout California. What’s not included? It is the homeowner’s responsibility to make and pay for for all repairs and replacements should any part of the equipment be damaged by lightning, electrical surges or other acts of God, fire, riot, war, terrorism, negligence, vandalism or any external cause. Buyer Beware: Cheap monitoring rates like $27.99 for standard phone line systems do not include the Quality Service Plan and you will be charged for repair and replacement parts including labor time. In most cases, service calls will cost between $400-$500 for the replacement of just one part. *Make sure to see Important Terms and Conditions of your contract for all the details about the warranty. Mover’s Package ADT Guarantee*: Moving? If you move from your home more than two years after becoming an ADT customer, ADT will provide you with a FREE ADT Security System for your new home PLUS 25% off add-ons. ADT Money-Back Service Guarantee*: Refunds the installation price and pays all monitoring fees if, after we have attempted to resolve your service concerns, you are not satisfied within six months of installation. If you want to go with a security company that stands behind it’s work and product, you’ve found the right company. After 140 years, you can trust the number one security company in America to continue leading our industry. With the Quality Service Plan include in your monitoring service, you can be assured you will be taken of if you ever need your ADT monitored security system to be repaired or replaced. For more information call 1-800-310-9490 today.